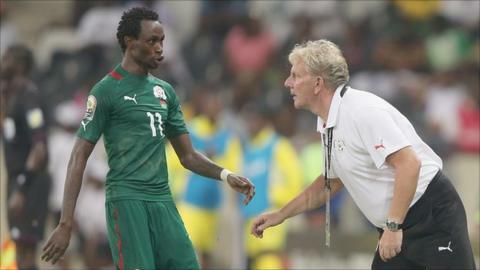 Burkina Faso coach Paul Put believes the Mbombela Stadium pitch will favour his side more than Ghana in their Africa Cup of Nations semi-final clash. The two teams meet on Wednesday on the much-maligned surface in Nelspruit. The Stallions have played all four of their matches at the tournament on the pitch, including their 1-0 win over Togo in the quarter-finals. Ghana have played all their games on the lush green Nelson Mandela Bay Stadium pitch in Port Elizabeth. "It's always an advantage [having played on the pitch] but Ghana is also a technical team and a physical team as well," Put said. "But it's still an advantage for us as we are playing in a 'home' game. "Even though the pitch is very bad it's our home stadium and we have nothing to lose as no one expected us to play in the semi-finals." Put says his players have adapted their game to suit the surface where the bounce of the ball can be very deceptive. "It's very difficult because you need one or two controls before you can play the ball, while on the training ground its only one touch. "So I told the players to be patient and stay well organised because with this pitch you never know. "With one error they can kick your head off, so we have to be careful." The Belgian coach says his first task in preparing the team to face Ghana is to bring his players back to earth after Jonathan Pitroipa's header sent them into the semi-finals for the first time since 1998 when they achieved the feat on home soil. "I'll keep them with both feet on the ground - I know Africa a little and if you let them fly it never ends," he said. "I'll congratulate them and tell them I'm very proud but there's still a job to do and as long as it's not done you have to concentrate and stay focussed on your work. "We respect Ghana they are a great team and great players but one thing is sure we are playing in Nelspruit for the fifth game - so it's our home stadium now." Historically, Ghana have the upper hand over Burkina Faso at the Nations Cup finals, having won all three encounters between the two. In 1978, the then Upper Volta lost 3-0 while in 2002 the Black Stars won 2-1 and most recently they triumphed 1-0 in 2010 - all the matches were in the group stages of the tournament.